They enjoyed a boat trip tasting the cocktail "Agua de Gelves" and several desserts typical of the locality, as well as discover aspects about our history, nature and culture. Gelves received last week the visit of several travel agents of Seville, with the intention of knowing firsthand the main tourist resources of our locality. And they did it by the hand of the City Council and Prodetur, a Provincial Council in charge of the economic and tourist development of the province of Seville. The visit began in Puerto Gelves, where after knowing their characteristics and services, they could enjoy a boat trip, the Trafalgar Charter, during which they tasted a cocktail called "Agua de Gelves" and some desserts made with bitter orange, Of our land. They also received information about our history, culture and nature from a very special and experienced guide, Franc Rodríguez Roldán, from the Suravante company, installed in our marina. 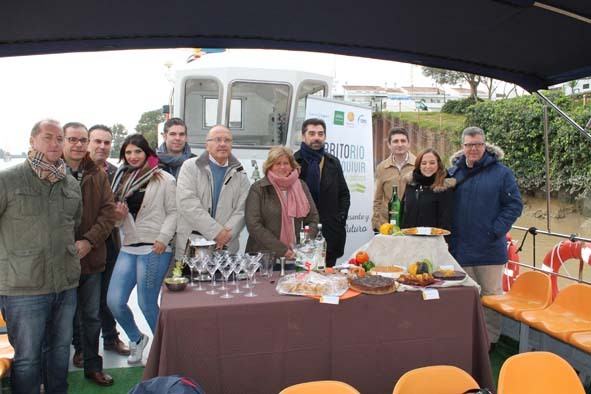 Both the cocktail and desserts are the result of an initiative launched by the Tourism Delegation of the City of Gelves, and seconded by our bars and restaurants, to promote gastronomic tourism in our municipality. An initiative that is getting to put in value the products and dishes typical of our traditional gastronomy, many of them already incorporated to his letters. This measure is part of the Territorio Guadalquivir project, promoted by Prodetur, in which these agents, belonging to the Association of Travel Agents of Seville, also knew other resources from other nearby localities such as Coria and Puebla del Río. The cocktail, which will be officially presented by the City Council in collaboration with Cafeteria-Bar Seispiés, was elaborated by the cocktail chef Mario Navas, several times champion of Andalusia, Spain, Europe and the World for his mastery of cocktail technique. - CHOCOLATE TART FILLED WITH ORANGE ORANGE (BREWERY MATEO). - MOUSSE OF CHOCOLATE AND YELLOW ORANGE (MANOLO CORNER). - BLACK CHOCOLATE TART WITH ORANGE ORANGE AND MANDARIN SOUP (PUNTO Y COMA). - PUDIN DE GELVES A LA AMARGA (THE CUADRILLA). - CAKE OF CHEESE WITH BASE AND VARUCES OF ORANGE YELLOW GELVES (BAR RESTAURANT LA MARINA). - MAGDALENAS DE GELVES (THE COFFEE). - CHEESE CAKE WITH BROWN MELONELADE (GREAT BREWERY MATEO). - CHOCOLATE TART WITH ORANGE ORANGED JAM (BAR RAÚL).